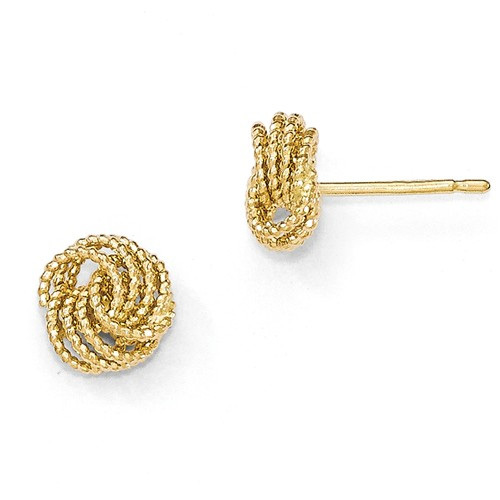 These unique and playful textured 14K gold love knot earrings from Apples of Gold Jewelry are a great choice for those who want to add a little bit of playfulness to their wardrobe! With a push back closure design, you can be sure that your earrings will stay securely in place during wear. The 14K yellow gold of the earrings and post offer a warm and charming look, and the 9mm by 9mm love knots have an almost beaded look to to them - perfect for adding something new to your daily routine! We guarantee our Textured 14K Gold Love Knot Earrings to be high quality, authentic jewelry, as described above.